The marital contract that spouses enter into at the time of the marriage includes many provisions that I often find are a surprise to some people. One area where marriage makes a big difference is how property passes at death. If you are married at the time of your death your spouse has important rights to your estate, whether or not you made a Will. And the law does not consider you unmarried just because you are separated or there is a divorce case pending. Only the final judgment of divorce changes your status for decedent estate purposes. 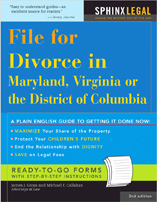 A limited divorce does not terminate spousal estate rights although Virginia, but not Maryland and the District of Columbia, bars the estate claims of surviving spouses who abandoned the decedent. See Va. Code Sec. 64.1-16.3.